Heat grill. In shallow bowl, combine bell peppers and onion. Drizzle with olive oil; toss to coat. 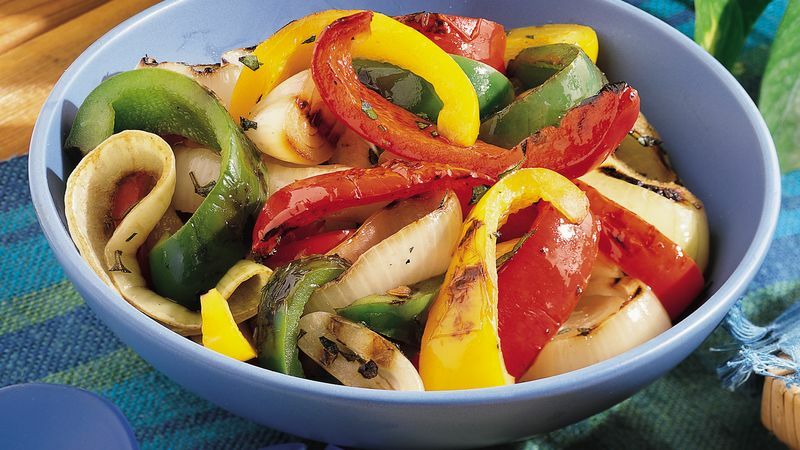 When ready to grill, remove peppers and onion from oil with tongs; place on gas grill over medium heat or on charcoal grill 4 to 6 inches from medium coals. Cook 12 to 14 minutes or until crisp-tender, turning once. Meanwhile, combine vinegar, oregano and garlic in same bowl; mix well. Cut grilled peppers into 1/2-inch strips. Add peppers and onion to bowl; toss to coat. If desired, season with salt and pepper to taste.